I hope everyone had a very Happy New Year! For those who went back to school today, I'm so sorry! I definitely need a few more days to do, well, nothing, really. One of my greatest accomplishments this vacation was to finish up my Weekly Language Review Sheets for First Grade. There are 30 review sheets included and they cover the language common core standards. 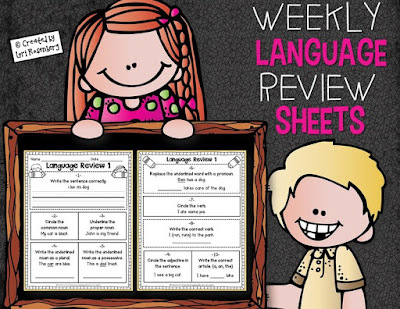 The review sheets cover the same information each week, however, as the weeks go on, they increase in difficulty, with the words and sentences becoming more challenging to read. The children are able to master the concepts because they are exposed to them every single week. The sheets are filled with countless high frequency words, consonant digraphs, inflectional endings, and irregularly spelled words. They can be used in whole groups, small groups, as assessments, or for homework. They really help me know who may need additional help with a specific skill. If you click on the image below and download the preview, you will see how Lesson 20 is much more difficult than Lesson 1. In other news, I made you all a little freebie to enjoy if you do a winter unit. 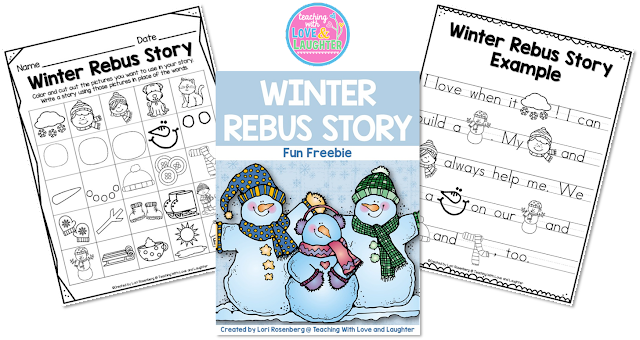 It's a Winter Rebus Story. Just click here to grab your copy. If you download it, please let me know if you like it. Thanks! I can't wait to use the grammar review in my class! Thank you so much for the freebie. As usual, your work is amazing! Thanks so much Kristen! Let me know how it goes! Yay! More frames are coming! I'll wait patiently for them! Love them and love you! Thanks, Annie! Enjoy, Gladys! Yes, Annie definitely has it going on! What a great product Lori!! I am always amazed by what you create! I go back to school tomorrow, so your freebie is perfect for the 2 days back. Have a wonderful New Year! I hope your first day is a great one! Happy and Healthy to you, too! The grammar sheets look great. They are on my wishlist now. I've never done rebus stories with my kiddos, but I'm going to try them out when we get back next week! Thanks for sharing! You are very welcome, Kristy! Enjoy! Thank you so much for sharing this with us! It's adorable and I will definitely be using it when I go back next week! That's great! I hope your children enjoy them! Sarah, I'm so glad you like it! Love the freebie!! Thank you, Lori!! Totally interested and have to have your grammar review sheets! Hey, Kristin! Enjoy the freebie and the grammar review sheets! I'm so glad I found you on freebielicious! Thank you for the rebus story! What a neat idea! I just became one of your followers and can't wait to read your past posts and future ones to come! Welcome! I'm so glad you like the rebus story. I just made a whole bunch more. Your grammar pack looks wonderful! ALready in my shopping cart! Thanks for the freebie too. It's so cute and I know I will make use of it when I go back to school next week. I also LOVE Annie's new frames. Have a great week! Thanks so much, Sarah! Yes, Annie's frames are just fantastic! I'm really enjoying them! I hope you have a great weekend! I'm so glad you like it, Kim! Thanks for introducing me to Jen Jones. She lives very close to me, and I hadn't heard of her. THANKS!! Thanks also for the freebie. What a small world! She's so darn talented! Thank you for the freebie! I am going to try using it with my Kindergarteners when we go back next week. I wonder if Jen will make a font for me. I must contact her. LOL. I may juts go visit. I am dying to meet her. Hello Tania! Sounds like a great font! LOL! Oh my goodness... I love the freebie! What a great idea! I have it set to share on my fanpage on Sunday! I love this freebie! I can't wait to use it with my class next week! Thank you so much! Cheryl, I'm so glad you like it. Just another activity to get them to write creatively. Enjoy! super cute idea for the rebus--and of course the font suits you perfectly as you are one of MY favorite bloggers. I hope you have a very Happy New Year, and on a side note--I just wanted to Congratulate you--you were on the Top 10 on TPT this Morning!!! I just found you through Teaching is Colorful. I am your newest follower. You blog is super cute. I am excited to read your posts. Congrats on making the Top 10! I really like your Grammar Review Sheets. Will you by any chance be making a second grade version?Love the new clip art from Annie! How fun to have a set named after you!